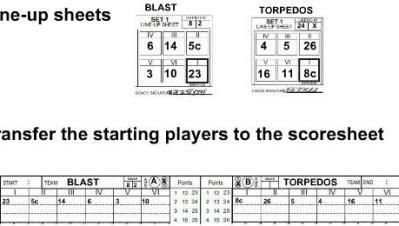 Scorekeeping volleyball step by step instructions. Arrive at least 15 minutes prior to the match start time. If you are playing the match before your work assignment, check in with the referee at the conclusion of your match. Let him or her know you will be keeping score for the next match. Two regular set scoresheets or one sheet that has two sets on it. One libero control sheet for libero tracking. Black or blue pen, pencils, and eraser. If any of this equipment isn't at the table when you arrive to keep score, ask the first referee for help. What you should fill out in pen is highlighted in yellow on the graphic. What you should fill out in pencil is highlighted in green on the graphic. Fill out the header section in pen if it hasn't already been filled out. The date. Month, day, year separated by slashes. The time the match is scheduled to begin. This isn't necessarily the actual time the match starts. The is done in international time. International time recognizes each hour of the day instead of using am and pm. Division. What division is this? Men's? Women's? Coed? Mark the box with an X. What category is this? Adults? Juniors? Again, mark the box with an X. City, State, Court and Pool. Always use capital letters. Fill out the entire section of the officials section. Remember to use all capital letters. Last names followed by first names. It is okay to have the referee's fill in there names if their names are difficult to spell. Print your own name. Don't sign your name until after the set is completed. Your signature indicates that you have checked over the scoresheet and are sure everything is complete. Fill in your teams name and region. Remember, all capital letters. After the coin toss, the referee will tell you which team will serve first and what benches each team will occupy. Fill in the team information and serving status. Mark an "X" in the S circle on the side of the team that serves first. Mark an "X" in the R circle on the side of the team that will receive first. Mark an "X" in the first service box of the receiving team. 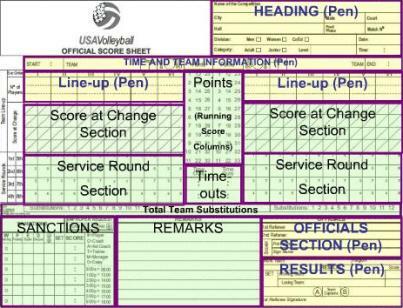 One of the first things you need to do when scorekeeping volleyball is enter the starting line ups on the scoresheet. One of the numbers has a "c" next to it to show that this is the captain of the team. There is also one or two numbers or an "X" noted in the libero box at the top of the sheet. The "X" in the second box will indicate the team doesn't have a second libero. If there are two X's, the team will not be using any libero for the entire match. If both boxes are empty, ask the coach if the team will be using a libero. Transfer the starting players to the scoresheet. The player in I will be placed in I. Player in position II is placed in II and so on. As the second referee is checking the line ups, you should do the same thing. Check to make sure you entered the line ups correctly on your scoresheet. Making sure the teams line up on the court matches the line up on your scoresheet is a good way to prevent future problems from occurring while scorekeeping volleyball. Once you are done checking the line ups, give the ready signal to the referees. 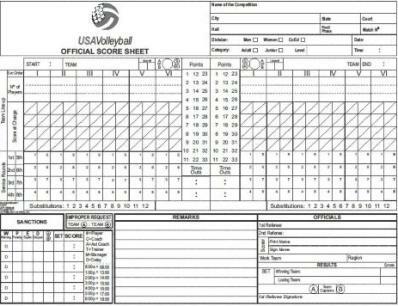 You now have all the information on the scoresheet and are ready to keep score for the first set.